Navy Cdr. 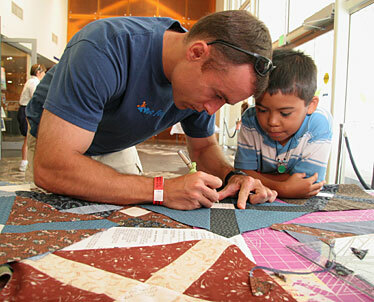 Dave Apezzato, left, and Ocean Miranda sign a quilt while on a Big Brother outing at Pearl Harbor. There is, simply, something comforting about a quilt. It's not just the layers of fabric and batting that keeps one warm on a blustery night, it's the thousands of stitches, each placed by hand and with care, a practical embroidery of compassion. The definition of art, also, is something made by hand that arouses emotions in others. And so, when a quilt created in the memory of Staff Sgt. Cameron Sarno, killed in Kuwait in 2003, was presented to his mother Judy, she immediately wrapped herself in it, swaddled by the thousands of stitches, caressed by the care that went into its creation. Through her tears, she said she would sleep beneath the quilt every night for the rest of her life. It is a mother's way of dealing with the death of a child. 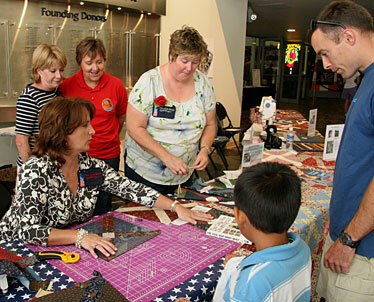 Home of the Brave Quilt Project members Sally Pincince, left, Mary Forde, Susan Hart and Mary Ruth Hudson sewed quilts in the lobby of the Pacific Aviation Museum - Pearl Harbor. Those who created the gift are with the Home of the Brave Quilt Project, a nationwide organization that is part crafts, part history, part commemoration. Quilt historian Don Beld of Redlands, Calif., inspired both by AIDS and 9/11 quilting projects, and by a little-known cottage industry during the American Civil War, created the movement to honor the more than 4,000 warriors killed overseas in the last five years. As of last week, 2,130 quilts had been delivered to 1,893 bereaved families across the nation. The Hawaii chapter was organized by long-time quilter Dawn Kucera, who dove headlong into the project after retiring from her civilian job at Hickam Air Force Base. "Dawn told me about the project when I joined the Hawaii Quilt Guild," said Mary Ruth Hudson, whose husband is a submariner at Pearl Harbor. "Quilters are naturally giving people. I've been sewing for years, but I feel so passionate about this. To honor a loved one who has made the ultimate sacrifice ... it's one small thing we can do." During the Civil War, the U.S. Sanitary Commission - forerunner of the American Red Cross - put out a call for cot-sized quilts, approximately 48-by-84 inches. Of more than a quarter-million quilts made by Northern families, only a handful survive today. Soldiers often asked to be buried in their quilts. 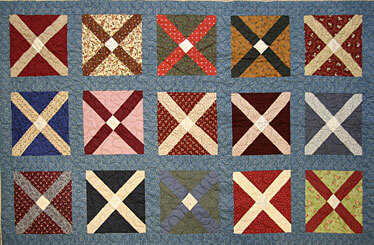 The only Sanitary Commission quilt on public display is in Beld's hometown, and Home of the Brave quilts are based on that pattern, pieced together of "album blocks" or "cross-X" patterns. The unbleached muslin center square doubles as a canvas for well-wishers to write personal messages, another Civil War tradition. Gov. Linda Lingle has signed dozens of these squares. Hudson, who sewed quilts for Civil War re-enactors while stationed in Charleston, S.C., feels a kinship with these seamstresses of the past. "The fabrics are different, but the techniques are timeless," she said. Detail of a quilt with Gov. Linda Lingle's signature. Sally Pincince, a Hickam Air Force Base mother whose husband has already been deployed twice to Iraq, ponders the vagaries of chance while quilting. "It touches me in a personal way ... it could be me getting one of these quilts," she mused. "This is one small way of taking care of those who take care of us. Quilting is a hobby, something I like to do with my hands. But this is a gift for someone, someone who needs to know that there are people out there who care about their sacrifice. 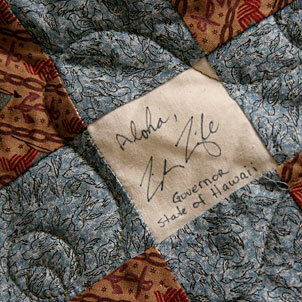 There are a lot of thank-yous to be sewed for the people of Hawaii." So far, Hawaii has lost 23 soldiers, sailors and Marines in combat. More quilts to be sewn, thousands upon thousands of stitches, each one with compassion. To help with the quilts call 677-9709 or visit www.homeofthebravequiltshawaii.org.